This half-day practical session will include both indoor and outdoor components and introduces the use of the latest Melbourne Water guidelines – Guidelines for Maintenance of Stormwater Treatment Assets. It is delivered on request and incorporates tailored components to specifically meet the individual needs of your organisation. 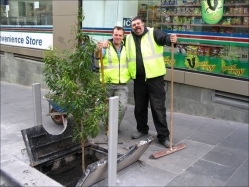 All council staff responsible for the hands-on maintenance, or influencing the maintenance of street-scale WSUD assets. For example, maintenance crews, supervisors and managers often from multiple departments. Often urban designers have found this session very useful to gain an understanding of the maintenance practicalities. This half-day practical session will include both indoor and outdoor components and introduces the use of the latest Melbourne Water guidelines – Guidelines for Maintenance of Stormwater Treatment Assets.These guidelines form a useful tool for those responsible for maintaining Water Sensitive Urban Design (WSUD) systems. After a brief introduction to the concept of a water sensitive city and the role of WSUD, attendees will learn about the function, principles and key components of WSUD technologies including raingardens, swales, tree-pits and permeable paving. In doing this, participants gain an improved understanding of the design of these systems and how they work, providing a sound basis to more effectively maintain these systems. Participants then learn about the typical maintenance activities required for WSUD systems including the ‘what, how and when?’ of WSUD maintenance tasks. The course aims to provide participants with the confidence to effectively carry out maintenance work and identify and troubleshoot problems arising with an asset. Maintenance of WSUD assets is often a challenge for councils; not only because of the unfamiliar technology, but because the maintenance responsibilities may extend across multiple departments and because it is not always clear how the maintenance should be resourced. For this reason, we facilitate a structured discussion at the end of the session to identify issues, roles and responsibilities and next steps for council to embed effective maintenance into their asset management procedures and practices.